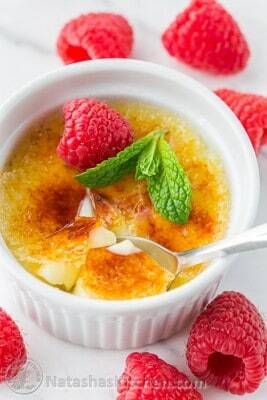 Quick Creme Brûlée Recipe - with or without a torch! Heat heavy cream, in a sauce pan, almost to a simmer, stirring frequently. In a medium bowl, whisk together 3 eggs and 1/2 cup sugar until blended. Slowly/gradually stir in the hot cream and vanilla. Start very slow or you may scramble your eggs. Strain the mixture through a fine mesh sieve into a large measuring cup with a pouring lip. Discard anything left in the sieve. Divide the mixture into 8 (4 oz) cups and place in a large baking dish. Fill the baking dish with boiling water about halfway up the sides of the cups. Bake at 300˚F for 35 minutes. Once out of the oven, remove from hot water bath, let cool to room temp then cover and refrigerate creme brulee until fully cooled. Put 1 to 2 tsp sugar on each custard, swirl to spread evenly. Torch the top - moving in a circular pattern until the whole surface is caramelized to a deep amber color. In a saucepan, combine the sugar, water, cornstarch and lemon juice. As soon as it starts to thicken, add berries and cook until lightly bubbly. Don’t boil. Let cool to room temp and spread on top of the creme brûlée just before serving. You can make this sauce ahead of time and serve the next day as well. if you are making the creme brûlées in advance, make this sugar topping before serving them. The sugar topping can liquify if you refrigerate it for very long.